A while back we found a tactic on the internet. Shown by experienced firefighters both in videos and articles. It seemed very practical, efficient and was backed by many years of proven field application at a department very far away from mine. We kicked it around the kitchen table, talked about it, and watched videos of this tactic being done on real fires. We did our homework, liked it, asked how it could apply to our Truck Co’s (staffing, saws, response) and decided it could work. That is not where it ended! It can’t!!!! We put it to the test, in the field, on real buildings, over and over and over again. DON’T be an Internet Firefighter! You have to question, research and than go out and train realistically on the information you find. There is a lot of misleading or unproven fire tactics all across the internet world. Don’t get caught in some of the traps. Get out, get dirty and get hands on experience with the tactic in question. Here is the video we shot a while back of us putting the Milwaukee cut to the test, the modifications are the use of a two person team instead of three and a chainsaw instead of rotary. It was highly efficient, made a large hole, and was quickly done on a steep roof. It blows the traditional coffin cut off of a single roof ladder out of the water. Very impressed. Simple. Proven. Efficient. It was our first time doing it and it is a little rough, but we learned a ton and got it pretty dialed in after a dozen holes. We thought the video was worth while to share strictly because there is not a lot of it out there on the internet. If your following this website I have no doubt you are following Urban Firefighter Magazine. Urban Firefighter is teamed up with FDIC and have developed the Urban Essentials class every year in Indianapolis. The Milwaukee Cut is one of the tactics they will train you on during their hands on course. David Rickert is one of the leads for this class and we were thankful for his insight regarding this method. You can read the original article in Urban Firefighter Magazine in Issue 2, Page 58 here and this is a link for the same author on Fire Engineering. Here is some commentary from David Rickert MFD, taken off of our Facebook page after a long discussion. This was some great insight by a guy that uses and teaches this tactic on a regular basis. Take the time to read it. I’ll try to answer some of the questions (love the Q and A here).Debris building up at the gutterline can be a concern and it is nice to have that 3rd man to clear it ,but it generally won’t be enough to push the ladder over or to the side, although when the ground ladder is fully extended and raised at an increased angle >75 or 80 degs. it may become a factor.The one other time is in the winter when you may have ice damming at the gutterline. 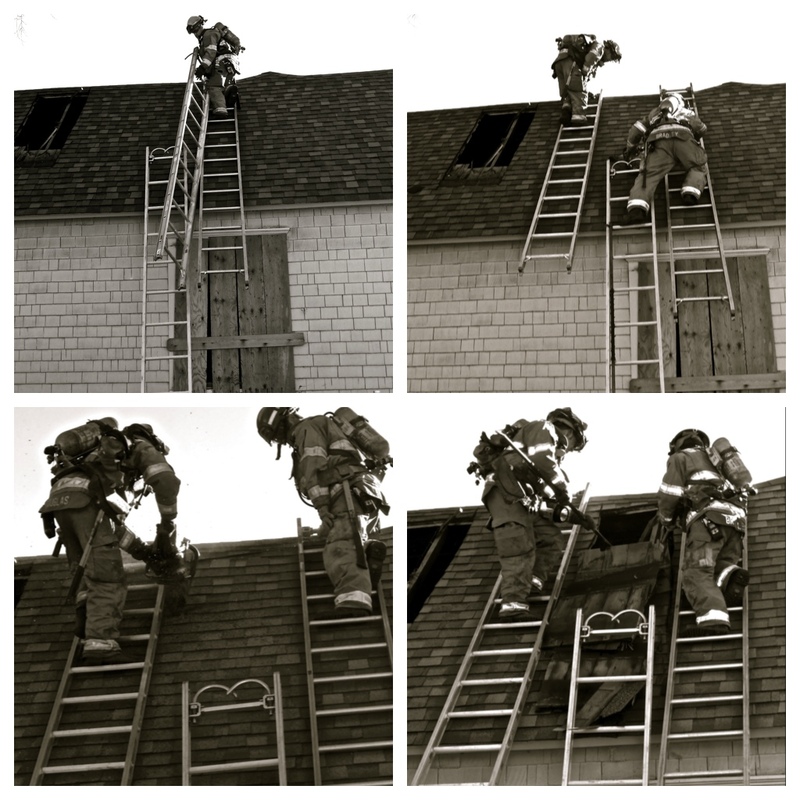 The roof ladders do not necessarily need to be placed on either side of the ground ladder.This will/should be determined by roof configuration and fire location. Once the hole is opened/pulled you shouldn’t be anywhere near the ridge.The placement of the roof ladders 4′-5′ feet apart is important for a number of reasons.1)- It will allow you to shuttle between the two without too much of a problem.this may take a little practice at first but becomes second nature.2) Pulling a wider hole consisting of 3 layer/shakes/1″roof boards will become very difficult if more than 2 or3 rafters are spanned.3)Saw hand-off and communication. It is the house which will determine the ideal number of people to accomplish the “Milwaukee Set”-All equipment should be able to be carried to the set-up position in one carry.so for a big house 2/1/2 story this includes(30-35 foot ground ladder,2 roof ladders,3 axes,One saw,possibly a pike pole) 1 or 1 1/2 story you can get away with 3 roof ladders (using 1 as a ground ladder) and 2 people should be able to perform this operation without much loss of efficiency.On a big 2 1/2 story however you lose a great deal of efficiency if you only have 2 people.What you can do on a larger house is borrow a 3rd person just for the carry and set-up, then let that person return to the ground for other duties. The time to perform this operation again varies widely depending on the crew,the house and roof config., the weather and the fire.In training with the crew on the same page on a 11/2 story 12/12 pitch we were getting pulled times in the 3 min range from boots on the ground.On larger homes it goes to 4 and 5 min and on the fireground another min or so beyond that.This evolution is very dependent on the crew and how much they have worked together. As far as securing the saw after cutting we have devised a rescue carabiner and ring system which allows us to hook the saw to the ladder when not in use. This entry was posted on 08/23/2013 at 11:42 am and is filed under Uncategorized. You can subscribe via RSS 2.0 feed to this post's comments. You can comment below, or link to this permanent URL from your own site. I’m suprised you didn’t mention Urban Firefighter Magazine as the source of the Milwaukee Method by David Rickert. Urban Firefighter Magazine is available at http://www.urbanfirefighter.com If firefighters want to learn this tactic they can take the Urban Essentials HOT class at FDIC. My apologies Ray, thanks for stopping in and reminding me. I will get a link on the main article also. I hope to attend that specific class next year. Outstanding variation on the Milwaukee Cut, had the pleasure to pick Dave’s mind at FDIC this year on the same tactics with a 2 person vent team and using a chainsaw as that is what I’m blesses with at My department. Great to see it on video. Keep it up! I agree with Chuck. I took the class out at FDIC and really liked the technique. I was curious how it would work back here in the East with our type roofs. This video makes it very clear that not only will it work but you can do it with a very good two man team. Thanks for all the good information on this site. Keep it going.